AN UNEASY peace has returned to Gaza following renewed undertakings between Israel and Hamas, the Palestinian Muslim Brotherhood that runs the besieged Palestinian enclave on the Mediterranean coast. Hamas leader Ismail Haniya says that an end to the Israeli and Egyptian decade-long blockade of Gaza was “around the corner” amidst a new American initiative to resolve the Palestinian problem. Rumours abound about a truce that would allow trade and humanitarian assistance to return to the beleaguered Gaza Strip in the return for the remains of two Israeli soldiers killed in 2014 and the release of two Israelis believed to be held by Hamas. At the United Nations the Zionist entity has countered calls by the UN secretary-general to boost protection of Palestinians against persisting Israeli atrocities on protesting civilians in Gaza Strip and the occupied territories by demanding action against Palestinian leaders, for allegedly inciting violence, instead. CONWAY Hall was packed to the rafters this week to condemn the vicious efforts of Blairites and Zionists to undermine Jeremy Corbyn. Hundreds faced a barrage of abuse from a Zionist gang as they piled into the meeting in central London on Tuesday, and a hundred more late-comers were turned away on safety grounds. Inside, the 400-strong audience heard speaker after speaker uphold the legitimate rights of the Palestinian people, and slam the smears that brand Corbyn and the Labour left as “anti-Semitic”. 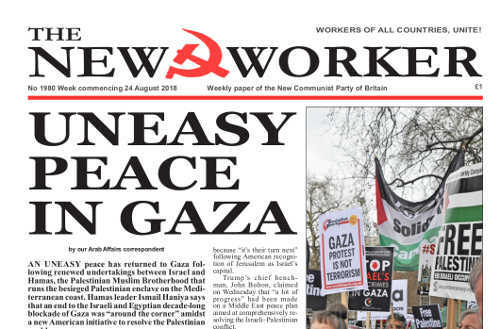 Called by the Corbyn, Antisemitism & Justice for Palestine campaign, the meeting was chaired by Christine Blower, a former teaching union leader, and the panel included a number of well-known Palestinian and Jewish socialists as well as the author Tariq Ali. CUTS in Somerset County Council spending don’t only effect their employees they also have an enormous impact on the most vulnerable people in society. Over a year ago a homeless man was found dead in a tent outside Weston-super-Mare in Somerset. His body was so badly decomposed that police have been unable to identify who the man was, despite a driving licence and birth certificate being found when the corpse was first discovered on 15th August 2017. The police still haven’t managed to make a formal identification. .
Licking the boots of Uncle Sam has been the policy of the British ruling class since the Second World War in the belief that this would help ensure continued American protection of their global interests in the post-colonial world. To a certain degree it did but only when it serves the over-arching interests of American imperialism. NIGEL FARAGE’S return to politics amidst reports that his followers are planning to flood the Tory party in order to boost Boris Johnson’s bid for the leadership may simply be just another silly season diversion by our worthless national media. But there’s no doubt that the former UKIP leader intends to play a prominent role in a new Brexit movement called ‘Leave Means Leave’.